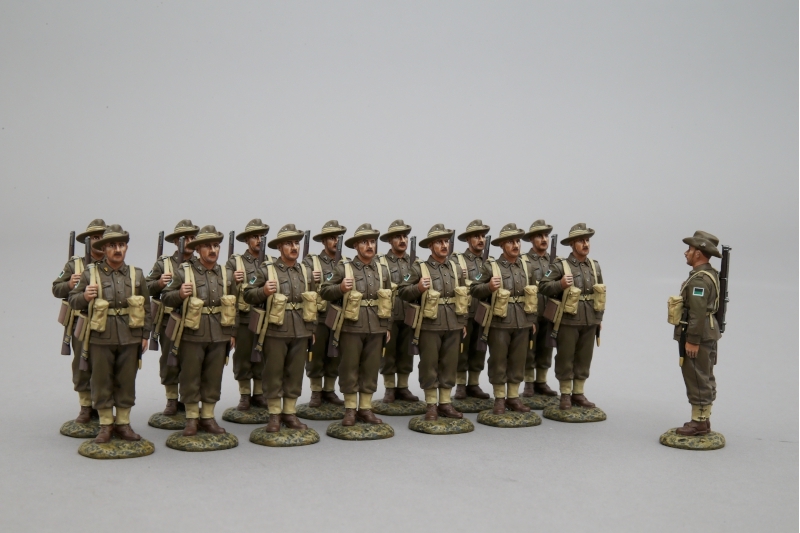 Another impressive collection from Thomas Gunn gets reviewed. It really is a great day when a parcel arrives from Thomas Gunn, full of goodies to review for the blog. Every time I go to open one of those silver boxes the contents always exceed my expectations! As it's Thomas Gunn my expectations are high as well. This time was no exception. Though the previous miniatures I've reviewed have all been outstanding, this particular collection, from my perspective, is the stand out one so far. Some of you know I have an obsessive interest in WWI, so it will come as no real surprise why I love this set of new releases so much. I have a group of what can be WWI air crew or just soldiers relaxing in the rear areas which includes a real life footballer and another historical figure of a War artist. We also have a WW2 Royal Canadian Commando, WW2 ANZAC sentry and finally a WW2 Japanese SPG to review! All have been released this month, September '16. The first miniature is a historical professional footballer from WW1. His name is Ben Butler and he enlisted into the Pals battalion 17th Middlesex which was also known as the first footballers' battalion. Prior to enlisting, he played for Reading and Queens Park Rangers. Sadly he never got to play professional football again as he was wounded by enemy shelling in 1916 around Lens and like many others in the 'Great War' died of his wounds. Rev. Samuel Green, a chaplain of Casualty Clearing Station No.22, recorded his impressions of the rugged centre-half: A great, big chap lies in this bed – a guard bulges up the blankets over his leg. ‘Well, Corporal, how are you now ?’ – ‘Bad. This leg is done in. No more football for me. I’m a ‘pro’ and play for…..’ I look at the papers and see his thigh is shattered – always dangerous, these wounds. However the danger is not immediate, and I shall have many more half-hours at this bedside. He fights for dear life for ten days, and then goes out. He has played the game. I doubt not that he has won. 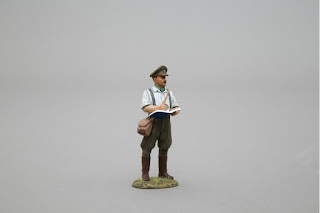 A fine fellow – may he rest in peace.’ May he rest in peace. He was wounded on 3rd May '16 and died ten days later. He was 29 and left behind Kate, his wife. 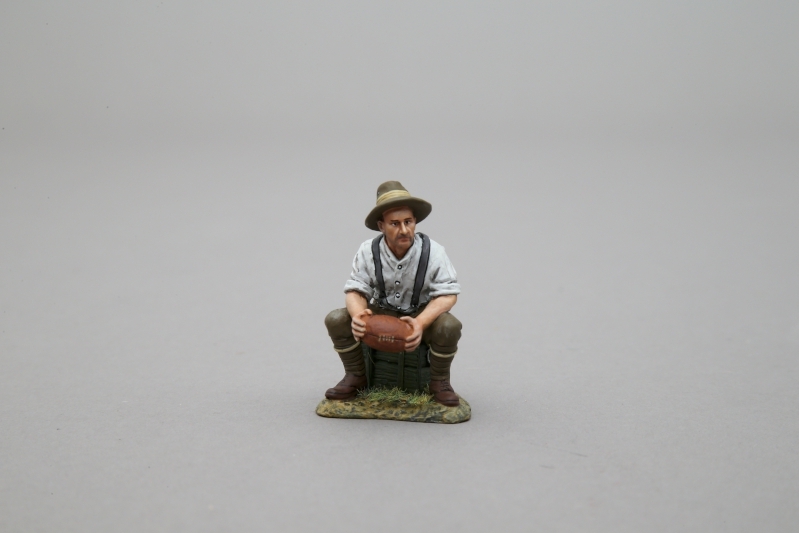 Ben sits on a crate holding his beloved football. The sculpt is a mini work of art. It really exudes character. The sculpture has to be applauded for catching so much and managing to tell a story. The pose he is in couldn't be any better. It's bordering on genius and it's easy to get into his mind, sat there on that crate. The detailing is superb and the paintwork faultless. 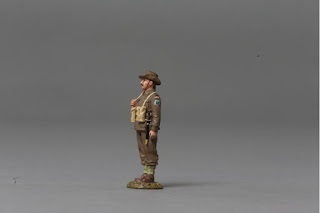 It's not just another toy soldier I'm looking at, but a real person. This makes it even more poignant. He is most likely dreaming about his exploits on the pitch before the madness started. Also no doubt, hoping the War finishes soon, not only to get back to his Kate, but also so he can eek out a couple more years playing professionally before he retires. At the ripe old age of 29, time isn't on his side, he thinks to himself. Well it's near the end of April and who knows the big offensive due any time soon might end the War and I'll be home in time for the start of the new season. The thought cheers him up. They go back to the front line the next day the 30th April. "Anyone fancy a game?" he shouts as he gets up from the crate. I love this miniature. Plus not only do we have Ben but we also have two other variants. The first is Daniel Minogue. an Aussie Rules Footballer. Daniel was lucky and survived the War. 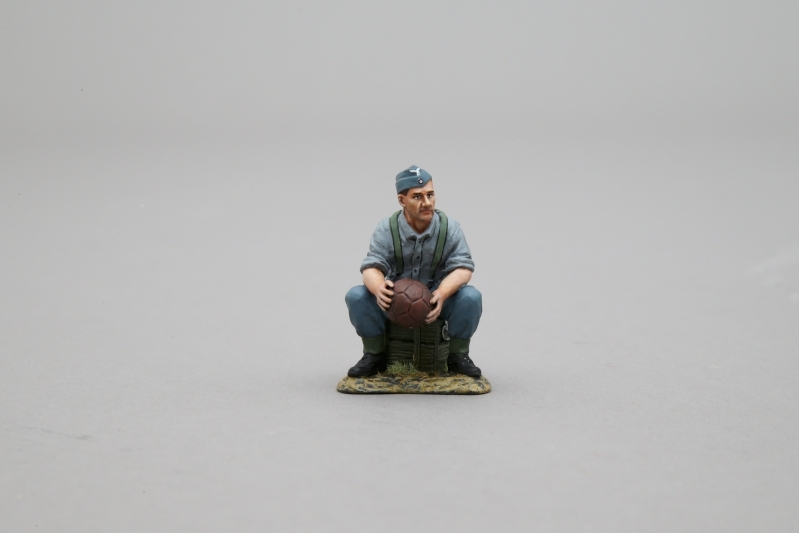 Next we jump forwards to WW2 and is Fritz Walter. He was drafted into a Luftwaffe unit, one designed to keep certain men out of too much danger. 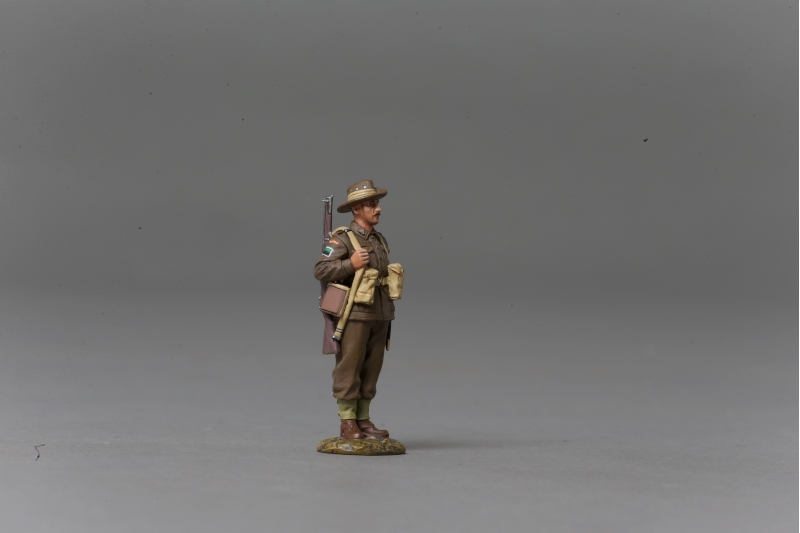 Ben Butler comes in the usual Thomas Gunn silver box, and as standard for Thomas Gunn, great care has gone into padding, so the miniature doesn't get damaged in transit. Actually one of the boxes had taken an obvious knock, yet the miniature was safe and sound, surrounded with foam padding. The next historical figure from WWI is war artist Muirhead Bone GW066A. With the first name of Muirhead it's obvious he was a Scotsman. He was commissioned an 'honorary second lieutenant' and sent to France in May'16 as the first Official British War Artist. He was sent to capture life in France with his pen and paper. Lithographs were the big thing back then and he produced two volumes and around 150 lithographs. After the War he was knighted and during WW2 did similar work. He died 21st October 1953. 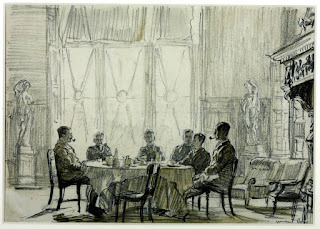 Muirhead is in relaxed dress, even sporting what looks like a cravat tucked under his shirt, as he sketches an aeroplane. Over his shoulder is a satchel that no doubt contains the tools of his trade. The paintwork is faultless and again the sculpture has caught a very natural looking pose. Looking at his face, apart from sporting a moustache, you can also discern an intense concentration in his eyes as he takes in this new wonder of science before him, an aeroplane. He stands on a texture base which is standard for Thomas Gunn miniatures. He comes in a silver box and just like everything to do with Thomas Gunn miniatures care has gone into the foam padding to ensure he arrives at your home damage free. 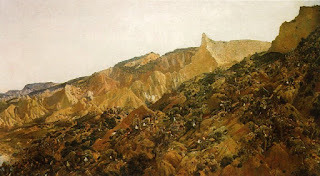 There is also another war artist GW066B; this time Australian War artist George Lambert. He produced some excellent images of Anzac cove in Gallipoli. 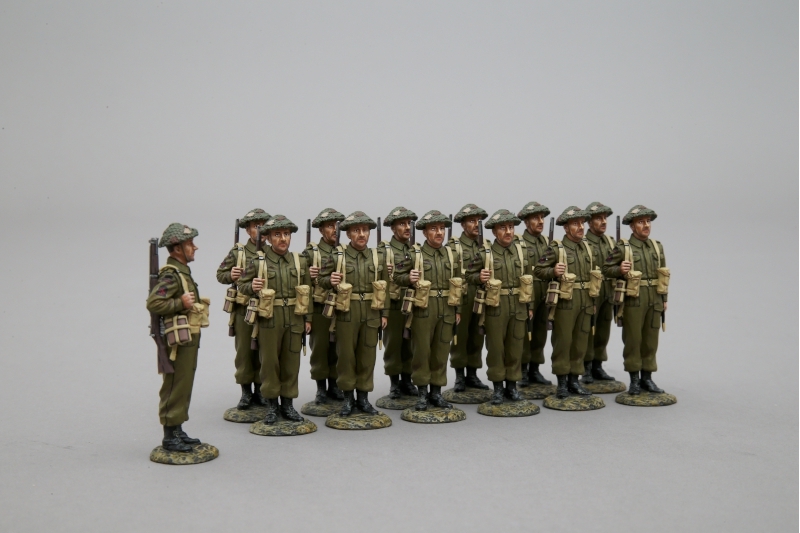 Muirhead and George are limited to 100 each and retail at £32. We move on from historical figures. 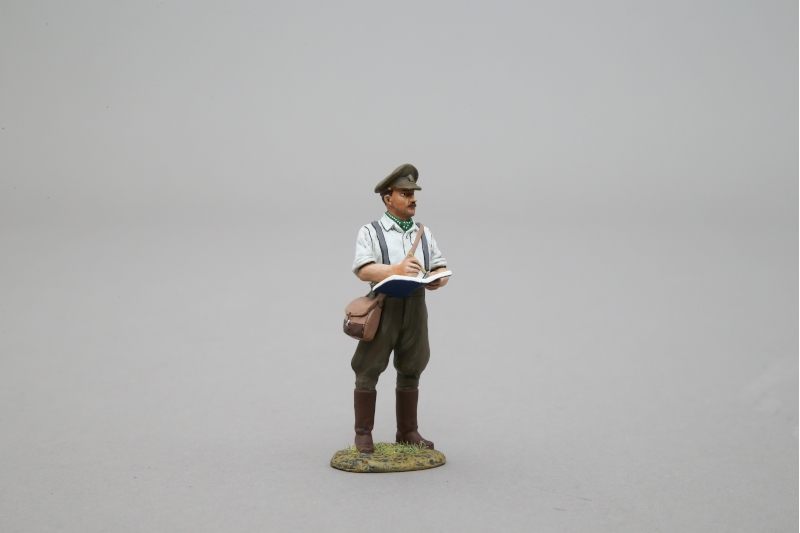 Here we have The Orderly GW065A. 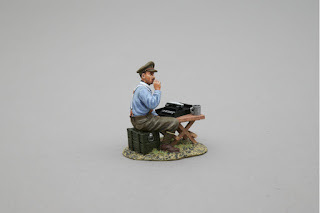 Sitting outside (camp site or airfield) using a crate as a chair and putting his typewriter on a little campaign table, he has decided to do his typing outside today. 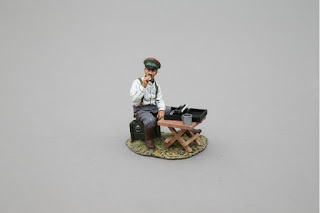 Just finished his cup of tea, he lights up his second to last army issue cigarette. He glances over to see that war artist in deep thought looking at the Be2c that's sat outside its hanger, as one of the squadron's observers climbs out of the front seat. This little set consists of four separate pieces. We have the orderly seated on his crate, then we have the table, followed by the typewriter and finally his cup, so you can arrange as you see fit. I love the pose; you can tell he is enjoying that cigarette. The paint work is excellent, with great use of shading. The table does look like it's made from wood, as the painter has done an excellent job replicating wood grain. I've just noticed on the base that they have used something to create little tufts of grass that look so realistic. It's a detail I haven't noticed until now, but it shows just how much work and thought goes into their miniatures. A sign of superb quality. Damn, I do love Thomas Gunn! He comes in a silver box which is well padded with foam. The Orderly also comes in a variant GW065B, a German version. Both versions are limited to 100 and retail at £35. The Tinker GW067A. This is another exciting little set that oozes atmosphere and is a diorama in its own right. The 'tinker' has grabbed the officer's wicker chair, whilst he is out on a long recon patrol. 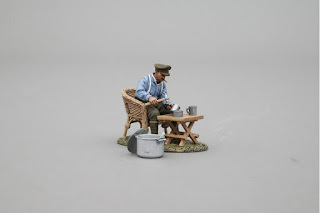 Having put up the campaign table, he's decided to get some minor repairs done to the mess kitchen equipment, which had been damaged during the previous night as the pilots let off steam. 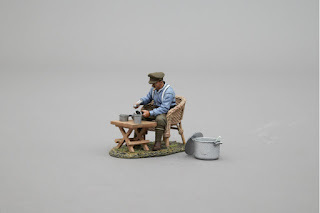 With a cigarette firmly gripped between his lips, he picks up his hammer and one of the pans, which needs a few dents hammered out, and goes to work. Funny, he thinks to himself, those pilots certainly got hammered last night, hehe, especially young Jones. I do hope he comes back safely today, being his batman has been very pleasant. Most likely the best officer so far. Not to say the other four had been bad in any way, just something about Jones reminds me of my son I suppose. God rest his soul, god rest all their souls, though hopefully Cpt Waverly is a prisoner; I liked him. Altogether we have nine pieces. The first is the actual figure seated in a wicker chair. Then we have a campaign table, a hammer, large pot, pot lid, cup, two small pans and a large spoon. The hammer and one of the pans you slot into his hands. It really is a great set though be careful as it would be very easy to lose a cup or pan, as they are very small. This chap is busy repairing some kitchen equipment, with the obligatory cigarette in his mouth. He is sitting outside and if you look closely you can see tufts of grass. Such amazing detail and little touches like this put a smile on my face. Everything has been sculpted with great care even the little cups and pans. The wicker chair looks excellent. You'd think it was made from wicker, just as the campaign table looks to be made from wood. The paintwork is yet again faultless (honestly I do look for something to fault, just every little thing has been done to such a great degree I can't find anything). He comes in a silver box and great care has gone into the padding. 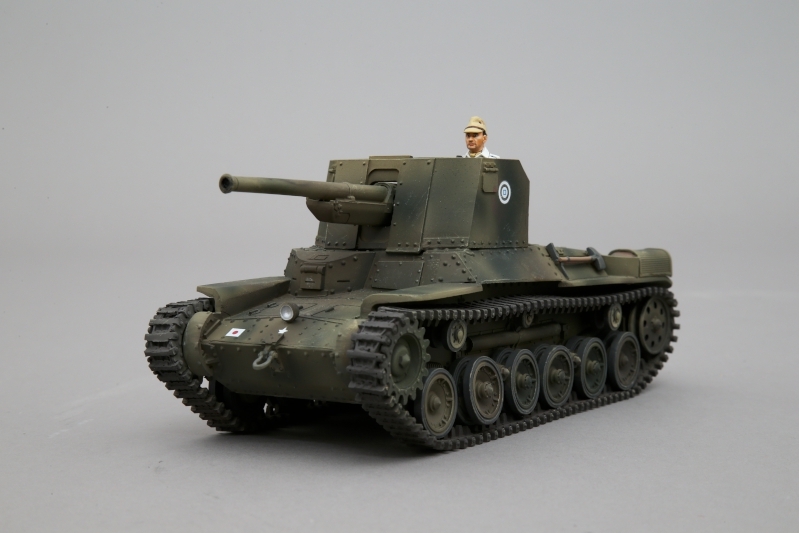 There is also a German variant GW067B. This time in German dress. Following the 'Tinker' we have the 'Tailor' GW068A. Another impressive miniature. 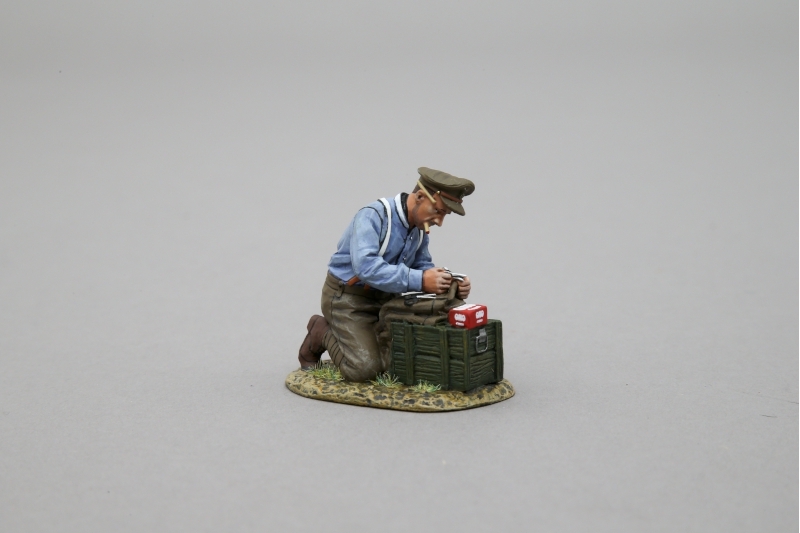 It's time to do some repairs to his service issue trousers. 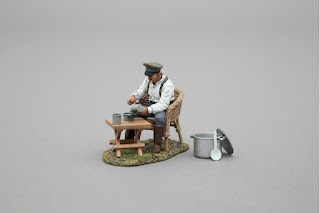 As the sun is out, he decides to get some fresh air rather than stay in the current abode, a hot, flea-ridden barn with barely enough light to find your boots in the morning, a typical enlisted man's abode whilst travelling around the French countryside. 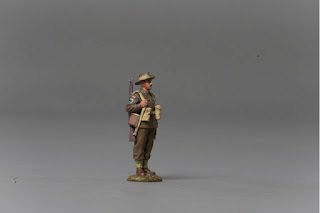 Grabbing his trusty little OXO box which contains his darning tools, he grabs a crate, finds the tear caused by barb wire whilst out in no man's land the previous night when out on patrol. 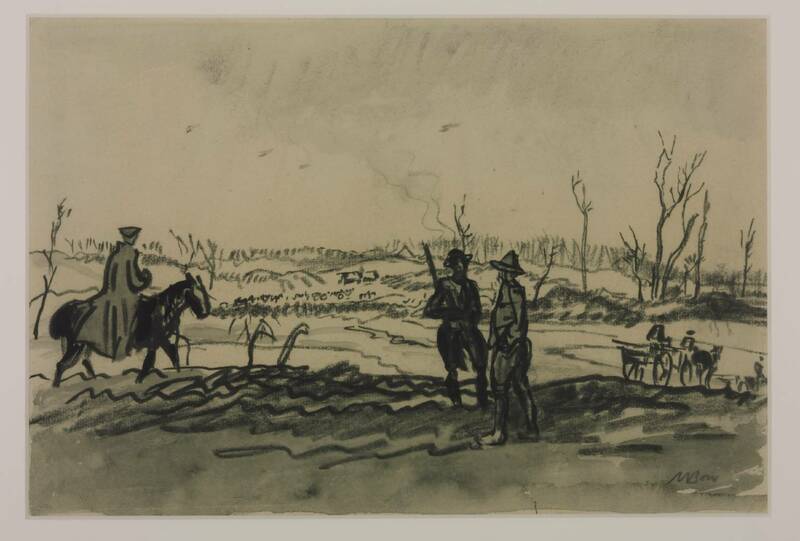 He was one of the few who actually loved going out at night into no man's land, loved the adrenalin rush. 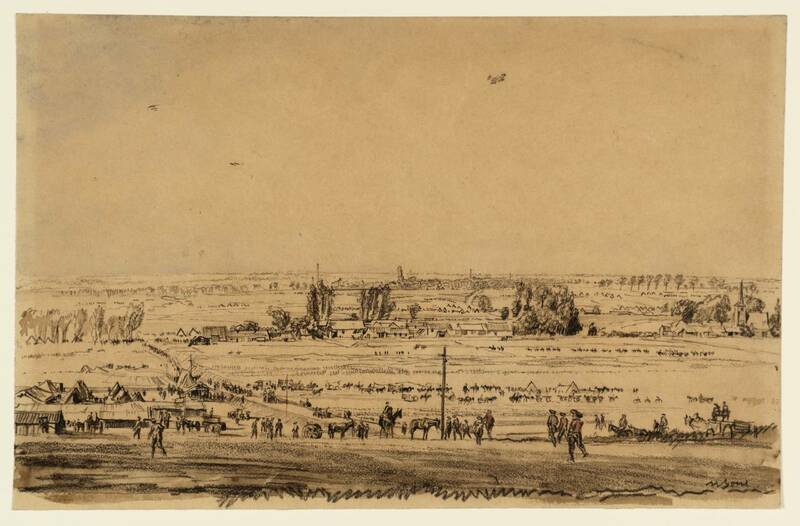 In the early hours of the morning, his battalion had pulled out of the front line into the rear for a rest. 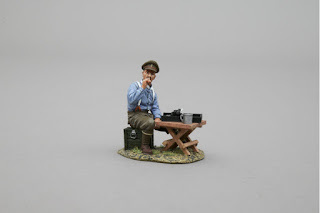 Being a pre-war soldier, he had also learnt the art of smoking whilst never taking said cigarette out of his mouth until finished, keeping his hands free to do the important jobs. 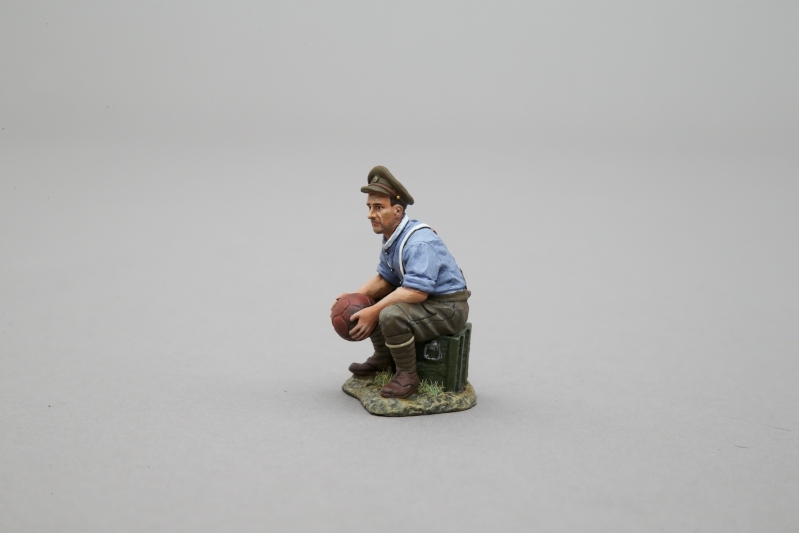 This miniature is just one piece - so no need to worry about losing anything. I love the OXO box. A fantastic detail and I think you know by now Thomas Gunn is all about the detail. He is using what looks like a small set of scissors, though I could be wrong here as it may be some sort of darning tool I'm unaware of. There is a set of large scissors resting on his trousers. Like the others, the pose is very natural and realistic. The paint work is, and sorry I'm going to use that word again, faultless. Shading is excellent. The painting of the OXO box is perfect, for such a small part of the sculpt great care has gone into making sure you can read the word OXO Cubes on the box. 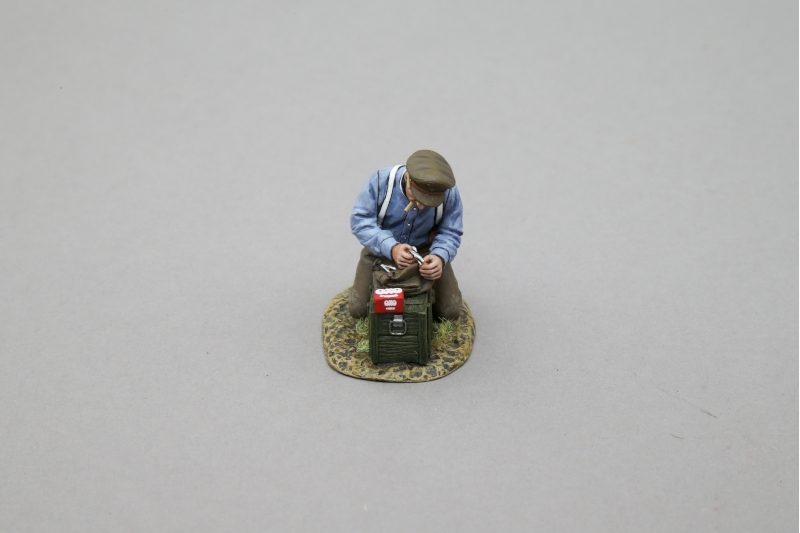 You can see the concentration in his face as he works wonders repairing his trousers; he'll get lots more wear out of them now. He has what looks like a pencil behind one of his ears. Even the hobnails on the bottom of his boots have been sculpted. The base also has small tuffs of grass, something I love, small things please small minds - is that how it goes? 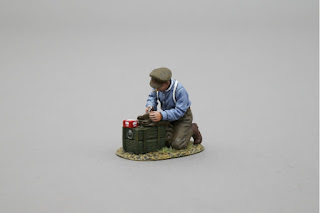 He comes in the usual Thomas Gunn silver box with the miniature encased in foam padding. 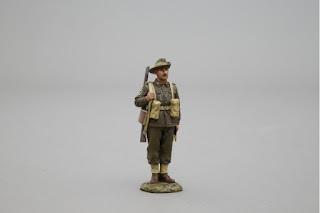 This is the final WWI miniature released this month and completes a great little set. There is a German variant GW068B. Both versions are limited to just 100 and retail at £32. Now we move onto WW2. This time we have Royal Canadian Navy Beach Commando CAN001. These Canadians had been specially trained for the Normandy landings. Their training was extensive as they had to be prepared for pretty much every conceivable circumstance the beach landings might throw their way: from controlling traffic, to removing obstacles, even driving Sherman tanks! Though their No1 job was to control the flow of troops and supplies during the first days of the invasion. 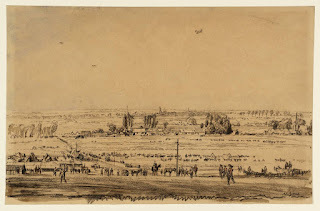 They made sure everything was flowing up to the troops on the frontline, so those at the sharp end could keep on pushing off the beachhead and on into the French countryside. Here we have him standing to attention whilst on parade, just before they all set off for D Day. He is wearing Canadian service battledress uniform with the R.C.N Commando insignia on his left and right shoulder. 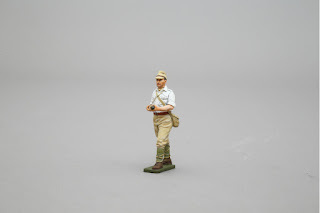 His rifle is slung over his right shoulder. He has his water canteen on his right hip attached to webbing and his bayonet is on his left hip. Two ammo pouches are attached to the webbing, one on each side of his waist. He is wearing a Mk2 helmet that has a camo net and some leaves added. The painting is top quality. 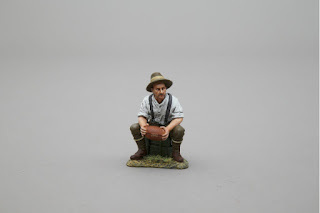 Another excellent miniature from Thomas Gunn. There is one tiny thing though. The first slightly negative thing I've had to say across all the reviews so far. 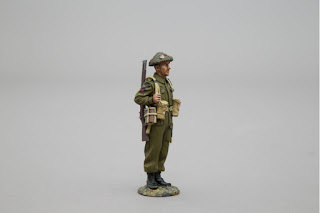 There is a tiny and I mean tiny bit of paint chipped of on his right shoulder where the RCN Commando insignia is. I told you that I do look in great detail for something to fault and this is the first time I've had something to say, which can't be bad. You do really have to look closely to notice it. I may have done it myself whilst handling it. I can't be sure. There is no variant this time. He comes in a silver box with the usual extensive foam padding. Limited to 100 he retails at £32. 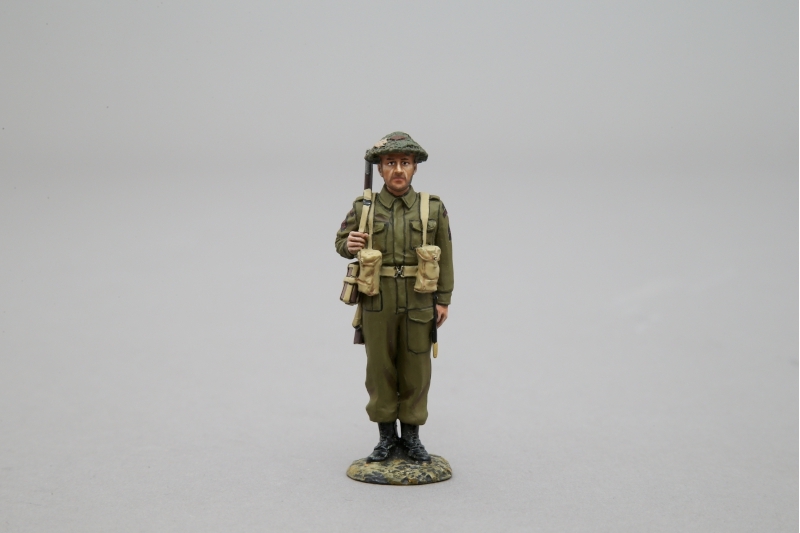 Still with WW2 the next miniature is Australian Sentry RS044. 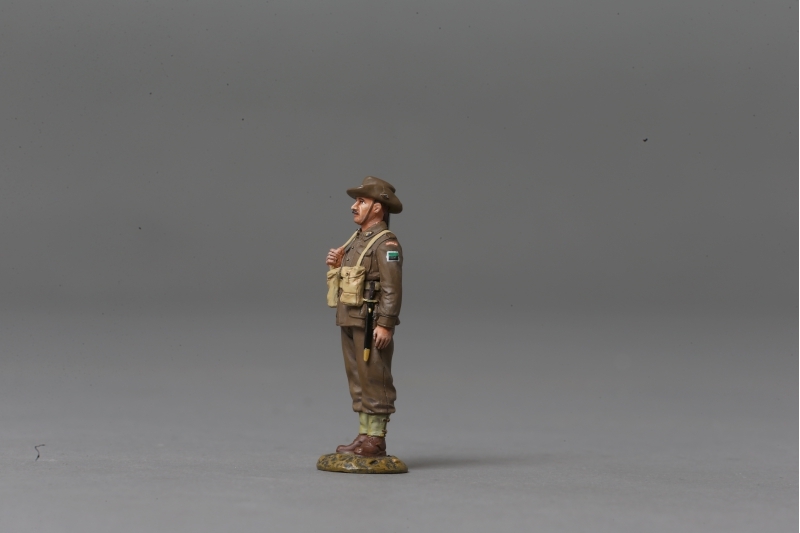 He has a black and green insignia on both shoulders and I've tried to see if this is a specific Australian regiment of a standard Australian insignia. 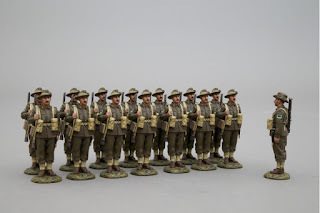 I have seen the same for a New South Wales regiment but couldn't be sure it was from WW2. He is wearing the easily recognisable slouch hat. Standing to attention, he has his rifle over his right shoulder. 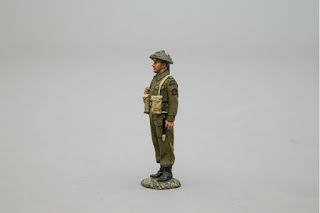 His canteen is attached to his webbing and sits at his right hip, his bayonet on his left hip. Two ammo pouches hang on either side of his waist. The paint work again is excellent. His brass buttons, belt buckle cap insignia, collar insignia and the buckles on his boots have all been picked out. He sports a fine moustache. He seems all set for future deployment, most likely somewhere in the Pacific. There is no variant. He comes in a silver box and is well protected with foam padding. Limited to 100 he retails at £32. Last to be reviewed this time is one of Thomas Gunn's bigger pieces. 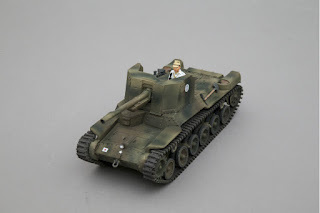 A WW2 Japanese SPG (camouflage) RS035A which was released this month. The SPG is the Type 1 Ho-Ni - Japan's first self propelled gun of this type employed by the Japanese during WW2. 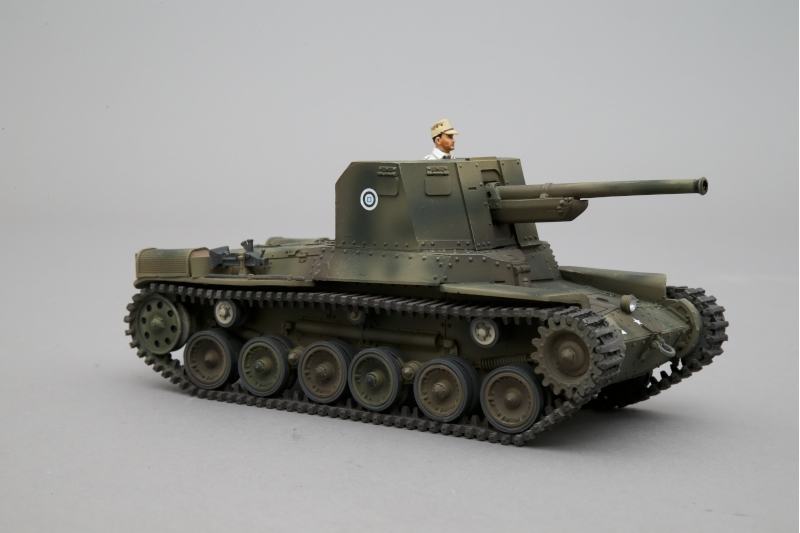 It used the Type 967 tank chassis. The turret was removed and replaced by a 75mm type 90 field gun mounted on a cut out chassis. With 10 degrees of traverse and -5 to +25 degrees of elevation plus being able to traverse 20 degrees either side, it didn't have to turn to be able to engage the enemy, unlike say Germany's Stug. It carried 54 rounds of ammunition, but a major drawback was a lack of MG for defence, so was very vulnerable to close assault by infantry. I really can't fault the modelling. It looks fantastic. Though I'm unfamiliar with this vehicle, I have no doubt it's historically correct right down to the number of rivets showing. This is the first large Thomas Gunn piece I've been able to handle and it doesn't disappoint. It's also very reasonably priced. 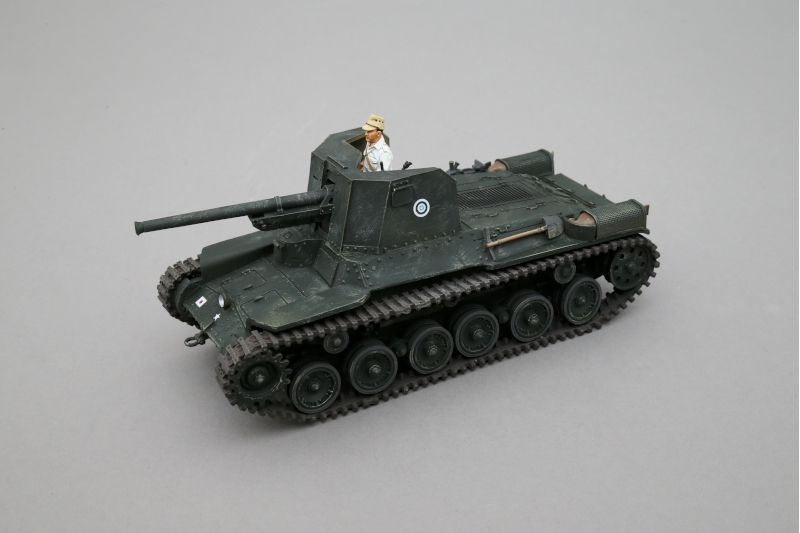 The SPG comes with a Japanese miniature holding a shell. He's all ready to put it into the gun's breach. The miniature is of the usual high standard. Faultless paintwork, just like the SPG. You can place him on either side of the gun but I have him on the left hand side just like in the pictures. There is a variant, RS035B, which isn't camouflaged ,but comes in dark green Japanese army paint. It comes in a silver box and extensive foam padding. Both versions are limited to 100 and retail at £135. Well I've come to the end of my third Thomas Gunn review. My enthusiasm for their miniatures just keeps growing and growing. I do hope you've enjoyed reading the review and do yourself a favour, get collecting! Until the next time! I repaired my car from mechanical Crash Repair Dublin and their service was absolutely amazing. I am sure I will go again there for servicing my car in the future.